Content in your bio headline (the top line in bold) is the only content in your bio that’s searchable on Instagram. Most people just use their name, but you’d be wise to consider doing more! Try to include some keywords that describe your business or product so people could potentially find your account through search. If your account is linked to Facebook, it will show your pages category in grey text under your name. Since this is front and center on your Instagram bio, make sure you are using the appropriate category for your brand. If you need to change it, you will have to do it through your Facebook page’s settings. Use short and simple bullet points to make it quick and easy for people to understand what you’re all about. Be sure to include your basic product/service offering, something personal about you that sets you apart from the crowd, and a reason why they should follow you or click your link. Pro Tip: To make sure the bullet points format correctly, type a draft of your bio in Notes before copying and pasting them into your Instagram bio. Represent what you’re all about visually with emojis. 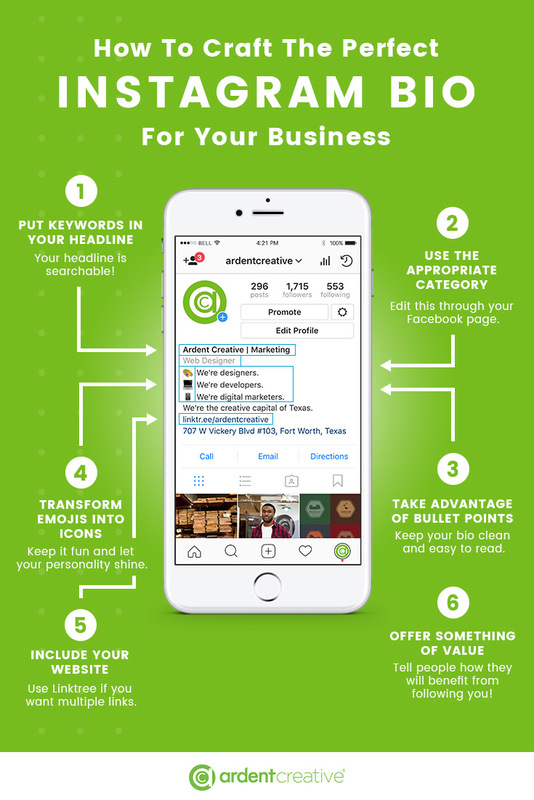 One great way to do this is to use emojis as your bullet points, like an envelope by your email address or an arrow pointing to your website link. This is where you can let your personality shine! Aside from general brand awareness, one of the main goals of Instagram is to eventually direct traffic to your website. Make it easy for your followers to get there by including a link to your website in your bio. If your link is a lead magnet or a specific piece of content other than your website homepage, make the last line of your bio a description of what the link is (example: Get my free course about Instagram marketing here). Pro tip: Have more than one link that you’d like to include? Linktree is a great way to direct your audience to different websites/pages, and it keeps your bio looking clean. Tell people how they will benefit from following you! Whether you are offering positive and uplifting content to lift people’s spirits or you are selling a webinar that offers business solutions.